Back-handsprings Through Bridgetown: Riding boots used strictly for walking. Today is officially the last day of summer. 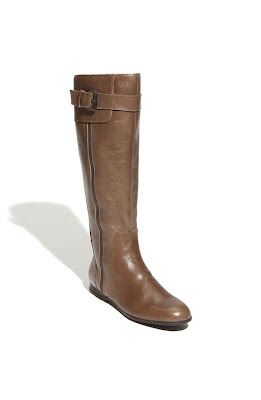 I would normally be sad… but I just got new boots and I am dying to wear them! I will be okay if it cools off soon so I can break those bad boys in! Seriously, I am very excited about the boots. I know it is absurd… but at least I admit it. I wish I had a picture of me wearing them. But again, it is still too warm. They are called the 'Zayra' Boot. On the baby name website (hilar) that Google gave me when I searched the name Zayra, I learned that it means radiance. Something I plan on exuding whilst wearing the boots (and in turn picking up a man). Pretty cool beans right? Boots are a challenge for me to find… due to the issue of big calves (thank you Joanne). But these fit perfectly! It is like they were made for me! The fate of it all is adding to the anticipation of boot season. Maybe I will do back-handsprings in them. Booya!